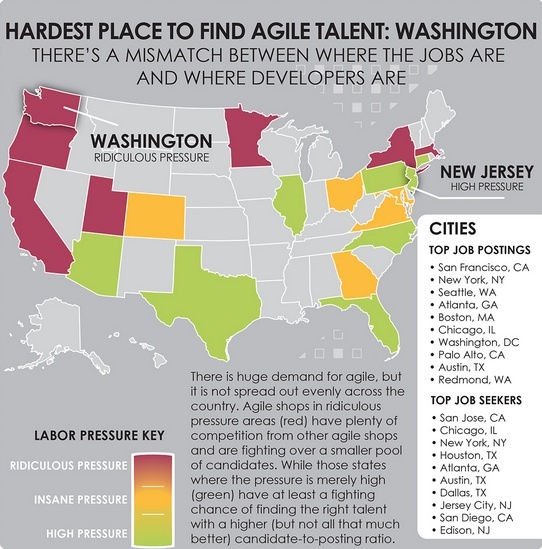 If you’re an agile development pro, especially on the West Coast, or in Utah, Minnesota, New York or Massachusetts, you’re pretty much in the catbird seat when comes to career moves. That’s one finding of new research by Yoh, a head hunting company using data from CareerBuilders. Agile development is an on-going, iterative approach to building and tweaking software by cross-functional teams over time. It’s a big change from more traditional monolithic waterfall development that leads to long release cycles instead of continuous improvement. The ratio of open agile development jobs to qualified candidates is 4.59:1, showing a market skills gap. While specific technical skills — such the ability to work with specific tools — are important, employers are more interested in knowing that the candidate has experience working on agile development teams and knowledge of that process more than of the tools themselves, said Joel Capperella, VP of marketing for Yoh, which is based in Philadelphia but has offices across the US. One Yoh client is a big bank with 250 agile developers across 10 to 15 Scrum teams. (Scrum is a real-time process used by many agile developers.) Most mature agile shops like this one are willing to train newcomers on the technology needed but want to be assured that the newbie has actually worked in this fast-paced, team-focused process before, Capperella said. A bad hire can have a ripple effect and hurt the company’s credibility in the tight-knit agile community, according to Yoh. So employers need to properly vet the candidate and need to make it clear just how mature their own agile process is at the outset. Top companies in the market for agile developers include Microsoft(s msft), VMware,(s vmw) IBM, Northrop Grumman(s noc), UnitedHealthcare(s unh), and SAIC(s sai). Spelling error… it’s Northrop Grumman. All the companies listed in your post are large enough to establish their own training and vetting centers. Unless “agile development” is just another “flavor of the month,” those companies should be looking toward long term solutions to the labor shortage. It’s last centuries (literally) flavor of the month so it’s all the rage now. Flavor of the month? Definitely. Agile is 20+ years old and is mostly ad hoc. Agility makes sense… in so many ways!